Lundy Rail Plant Manager, Rob Hollins sheds some light on a new vehicle wrapping solution. Anyone who works in the rail industry understands just how important night-time visibility is. 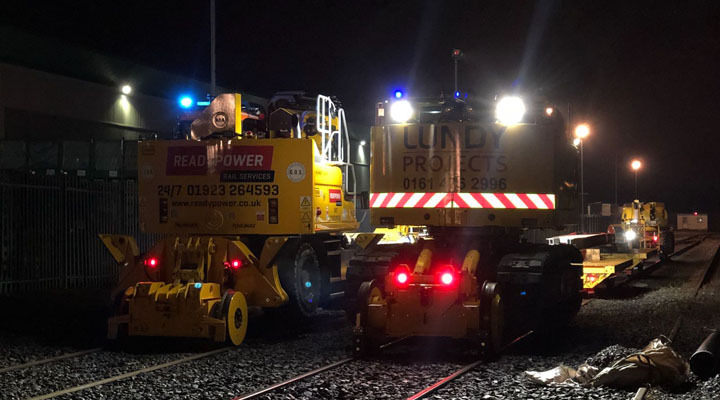 At Lundy Projects, practically all our railway construction work is carried out at night when passenger and freight services aren’t in use. This means that visibility is a key issue and something that, as a Rail Plant Manager, I need to give a great deal of consideration to. A lack of ambient light is one of the main hazards our workforce encounters during the hours of darkness. Often having to work in remote locations, we are required to consider how we can create task and operational lighting that is both safe and effective. Not only does our workforce need to see what they are doing, they need to be seen – and the same goes for the vehicles. At Lundy Projects, we are always looking for new and innovative ways to reduce the risks associated with our staff and plant interfaces. So, when new products and technology come onto the market, we are always keen to find out more. At the end of last year, I was introduced to a new and innovative ‘illuminated vehicle wrapping’ technology by FHOSS Safety Wear. The company are known for supplying high visibility PPE to the construction and highways industry. Indeed, having understood these issues, they have introduced a solution which, for the first time, illuminates vehicles. 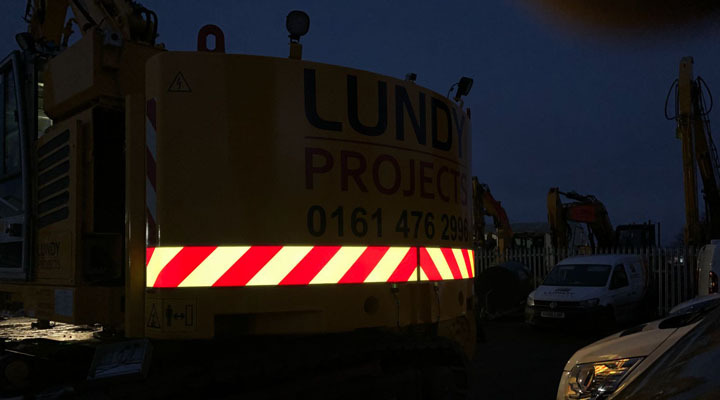 Lundy Projects have never considered the idea of kitting our vehicles out in high vis and it was something that we had to try. FHOSS’s vehicle wrapping technology works via an illuminated prismatic retroflective panel, which is tailored to each vehicle. While the tape does have a reflective panel, it doesn’t require a secondary light source for it to illuminate, so there is a constant glow emanating from the vehicles. The wrapping technology, which is water and weatherproof, is fitted for the duration of a vehicle’s lifetime, or the duration of the lease, and is compliant to the Department for Transport’s Chapter 8; it has also been product approved by Network Rail and SNC-Lavalin. There are several configurations to choose from and we opted for the chevron system to run along the width of two of our railroad vehicles. The beauty of this system is that we now have a clear demarcation for the rear end of the machine – meaning that these vehicles can be seen from behind always. The glow in the dark technology is so bright, that vehicles can be seen for up to one mile away even in the dead of night; however, while the FHOSS illuminated panel is powerful, it is not dazzling to those working close by. Until we came across FHOSS, we relied on each vehicle’s default head and rear lights – but now the workforce on the ground can see the exact outline of our railroad vehicles in complete darkness. This also means that the possibilities of any other vehicles on and off the tracks colliding with our plant are now reduced greatly. The feedback from our operatives on the ground has been positive and they report they feel much safer with this additional light source. While this is early days for the technology at Lundy Projects, we believe that this is highly cost-effective safety equipment. Once installed on the vehicles, the wrapping has a lifespan of 80,000 hours, which means that, for the significant duration of a vehicle’s life, we can get the benefit of the vehicle wrapping system for a relatively low cost. When it comes to safety, as a Plant Manager, I believe it is my duty to do all I can to ensure that we have maximum visibility for our machines. We have been so impressed with the chevron lighting system that we now have plans to roll out the technology on every single one of our plant machinery across the UK in the coming months. While high-vis PPE has come on in immensely since its early days, it is interesting that the idea of high vis on a vehicle is a new concept – but I can see it catching on and becoming a standard piece of safety equipment on all plant vehicles across the country. Lundy Projects are delighted to be early adopters of this technology and continue to lead the way forward in plant operational safety.